Objective: The Liberia Health Systems Strengthening Project (HSSP) seeks to improve the quality of maternal health, child health, and infectious disease services in selected secondary-level health facilities; and to support the emergency response needed to contain and control the Ebola outbreak. The maternal mortality ratio remains high in Liberia, but has declined from close to 1000 per 100,000 births in 2007 to an estimated 770 per 100,000 in 2010. Similarly, while over one in ten children will die before the age of five, infant and under five mortality rates have almost halved to 71 and 110 per 1,000 births respectively over the last 20 years due to improved access resulting from the Government of Liberia’s free health care policy, and the restoration of several key child health services such as immunization. 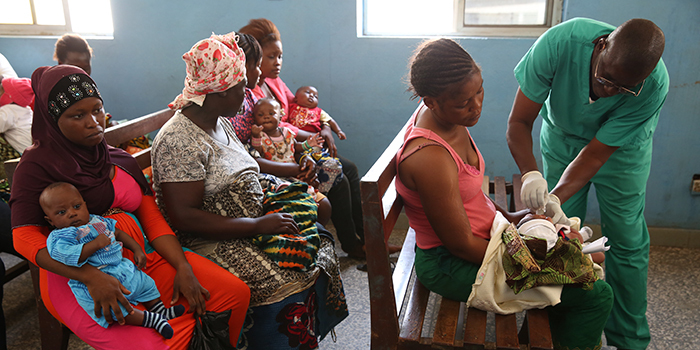 Despite impressive gains, Liberia continues to face significant challenges in improving maternal and child health outcomes. Quality of care continues to be impeded by significant shortages in qualified and productive health workers, inadequate equipment and inefficient drug supply chains. This is further compounded by geographic disparities – for instance, 77 percent of deliveries in urban areas being attended by a skilled provider against 32 percent in rural areas. Provide financial and non-financial incentives for health workers. The second scheme will be a county-level PBF scheme, contracting County Health Teams for the provision of services by the health facilities within their county. This PBF scheme will include both coverage and quality indicators at aggregate level for the county, with the aim of improving results at health facility level. It will largely build on and be aligned to the USAID Fixed Amount Reimbursement Agreement (FARA) PBF approach already implemented in three other counties in Liberia. This scheme will likely be launched in late 2017 and will be financed as part of the GFF. The ex-ante RBF verification (i.e. prior to payment) for the hospital PBF is to be led by a National Verification Agency contracted by the MOHSW to assess the quality of care and the quantity of serviced delivered. This assessment determines performance levels by combining the quality assessment score derived from the clearly defined quality checklist, and service delivery numbers extracted from monthly activity reports. Since the ex-ante verification function is carried out by an independent entity, there is no counter-verification. The nine-month pre-pilot at Redemption Hospital was finalized, and the scale-up of the hospital PBF scheme will begin during the course of 2017 following delays in the roll out due to the Ebola crisis. The quality checklist has been refined considering lessons learned from the pilot and drawn from the Ebola crisis, particularly regarding infection prevention and control. The impact evaluation (IE) aims to assess the impact of PBF on health outcomes and on the quality of care. Given the limited number of target hospitals, the evaluation will build on a “continuous data collection” system created in each hospital to track patient outcomes. Considered methods include Random Shift Designs and Randomized Introduction Time Interventions. Although the IE was delayed because of the Ebola crisis, it is now back on track. The report for the first round of the IE baseline has been finalized, and data for the second round (i.e. post-Ebola) have been collected – including for five control facilities.